An hour of nothing? Sign me up! Yesterday Lee and I spent an hour doing nothing... and it was AMAZING! Hope Floats (in MD, DC & NY) offers "Flotation Therapy" where you get into a capsule filled with warm salt water, otherwise known as a sensory deprivation chamber, and literally float with no sound & no light for an hour. It may make some people feel uneasy to think about doing this but as overworked, exhausted and stressed parents this sounded like the ideal way to spend an afternoon date! Complete silence with no one touching me or asking me for anything? YES please! 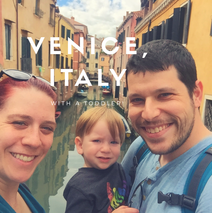 Verona, Italy... With a Toddler! Verona, Italy is the setting for Shakespeare's Romeo & Juliet. A city of young love, and just a few cities over from where we were based, so we took a day trip there from our friend's home in Vicenza. The weather was beautiful, the crowds were light, and it was a great experience overall. ​We took the double stroller and I also wore Bram in a carrier when needed. Florence & Tuscany, Italy... With a Toddler! When researching for our trip to Italy I came across this AirBnB listing….and I knew I HAD to go there! It was 30 minutes outside of Florence, an organic grain farm in a traditional land house in Calenzano. This picture was taken out the front door!! View of a lifetime!! Going to this particular place though meant taking the train from Vicenza wouldn’t be easy (the house is 3km away from the local station through windy dirt roads, and taxi’s are almost unheard of there). So we looked into renting a car from Florence, but for the weekend it was nearly $800 since we needed a van…normal European cars wouldn’t cut it with 3 adults and 2 carseats. Luckily our friend offered to drive us in her SUV from Vicenza, a 2.5 hour drive, if we paid for tolls and gas, easy enough for us! And yay we got to spend more time with them! !